Knowing what motivates another person is a peculiar and fascinating kind of mindreading. And yet it is evidence of a very human impulse. We often use a person’s perceived sources of behavior as an ethical mirror. At other times we face the more practical problem of determining how much we can allow our life to be entwined with another. “Can I believe him?” or “Can I trust her?” are—among other things—simple queries made in the spirit of self-preservation. 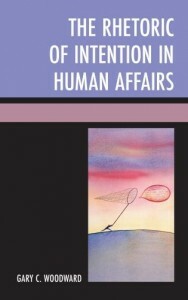 The Rhetoric of Intention in Human Affairs examines the rhetorical and psychological habits we exhibit when we must explain the reasons others act. Separate chapters cut a wide swath of analysis across a diverse range of human actors: including conspiracists who find the designs of coordinated agents behind random events, theater performers creating “backstories” for their characters, journalists grasping to name the motives of newsmakers, prosecutors who must establish another’s intent in order to prove a criminal act, and the devout who grapple with what divine intervention can mean in a cruel world. All point to the tenacity and frailty of the impulse to know why. “Timely and important. . . This is a fine resource, . . . Highly recommended.” –Choice, April, 2014. ” Woodward’s rendering of the mercurial nature of the human impulse to know why—a human propensity that we are inundated with but perhaps think very little about—makes Intention both a worthwhile and meaningful contribution. . . . The work is a worthwhile and essential venture into the underworld of why.” KB: The Journal of the Kenneth Burke Society, Spring, 2016. A Different Kind of Man? Can’t be Bothered with Democratic Norms? Why Not Undermine Someone Else’s?